Malala Yousafzai, the Pakistani Girl-Child Education Campaigner, has made a $200,000 donation from the Malala Fund for scholarships for the kidnapped girls and their education, a statement by the presidency said. Meanwhile, President Goodluck Jonathan will finally meet with some of the parents of the abducted schoolgirls from Borno state. 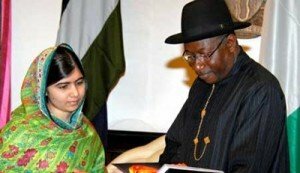 Making this known in statement, the president’s Special Adviser, Media and Publicity, Dr. Reuben Abati, said Jonathan made the promise when he met yesterday with Malala Yousafzai at the Presidential Villa, Abuja. The statement said Jonathan reiterated that the notion that the federal government was not doing enough to find and rescue the abducted Chibok girls, “was very wrong and misplaced”. “Jonathan said that the federal government was definitely doing everything possible to ensure that the girls were rescued alive and safely returned to their parents. “He however explained to Malala, who was accompanied by her father and other members of her foundation, that the federal government’s efforts were constrained by the overriding imperative of ensuring that the girls’ lives are not endangered in any rescue attempt. “Terror is relatively new here and dealing with it has its challenges. The great challenge in rescuing the Chibok girls is the need to ensure that they are rescued alive,” Jonathan was quoted as stating, stressing that the federal government and its security agencies were very mindful of the need to avoid the scenario in rescue attempts in other parts of the world where lives of abductees were lost in the effort to rescue them. The president told Malala, who met yesterday with some parents of the abducted girls, that he fully empathised with their pain and anguish. He said that he would meet with the parents himself before they left Abuja to personally comfort them and reassure them that the federal government was doing all within its powers to rescue their daughters. The president also reiterated his administration’s commitment to ensuring the safe and proper education of all Nigerian children, saying, “I personally believe that since about 50 per cent of our population are female, we will be depriving ourselves of half of our available human resources if we fail to educate our girls adequately or suppress their ambitions in any way. Also briefing State House correspondents after meeting with the president, Malala disclosed that Jonathan gave his commitment to meet the parents of the abducted schoolgirls at any time, adding that she was in Nigeria on her 17th birthday at a price, which was to see that every child goes to school. She said her objective this year was to speak up for her “Nigerian sisters”, about 200 of them who were abducted by the violent Islamist terrorist group, Boko Haram. “I met the president, Goodluck Jonathan, for this purpose. I conveyed the voice of my sisters who are out of school or who are still under the abduction of Boko haram. And for those girls who escaped from the abduction but still do not have an education. “And in the meeting, I highlighted the same issues which the girls and their parents told me in the past two days. The parents said they really wanted to meet with the president to share their stories with him. And I asked the president if he wanted to meet with the parents of the girls, he assured me that he would meet with them. “I spoke to the president about the girls who complained that they cannot go to school despite the fact that they want to become doctors, engineers and teachers. But the government is not providing them facilities. “They also need healthcare facilities, security and the government is not doing anything. These are the issues I presented to the president today. And the president fortunately promised me that he would do something for these girls and he promised me that the girls under the abduction of Boko haram would be released as soon as possible. The teenage activist expressed hope that the two promises made by the president would be fulfilled soon, adding: “Even though the promises have been made, it does not mean I am going to stop talking. I will be counting days and I will be looking for when those girls are going to return home.